The aim of Retake Rome is to make Rome live up to its innate beauty and become a sustainable city where the redevelopment and care of urban spaces contributes to the happiness of people. So every year Retake Rome promotes over 500 events in every sector of society. 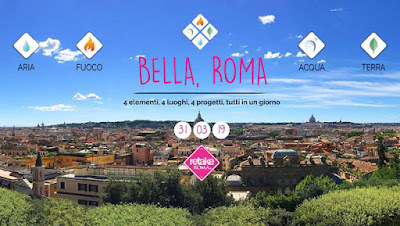 This year, to celebrate International Earth Day 2019, 4 parallel urban redevelopment and civic mobilization events will take place in 4 areas of Rome corresponding to the 4 elements (Air, Earth, Fire and Water). Along with Embassy of Canada staff and Free Exchange members, the CCR is going to paint Piazza Ragusa with the new CO2-absorbing paint that will have the environmental impact of planting a grove of trees. We'll also clean up the playground in the centre of the square. The “Air” site will thus contribute to the Retake objective of reducing "the adverse per capita environmental impact of cities by 2030." Come along to give back to "Bella, Roma" and its people at this family-friendly, sustainable and educational community day. Meeting Place: in the Colle Oppio park (metro: Colosseo). N.B. Wear comfortable shoes and clothes. Cleaning supplies will be provided. Retake is present throughout Rome and its province with about 85 neighborhood groups and more than 50,000 fans on Facebook. It is also present in 40 cities in Italy, including Milan, Brescia, Naples, Bari and Palermo.